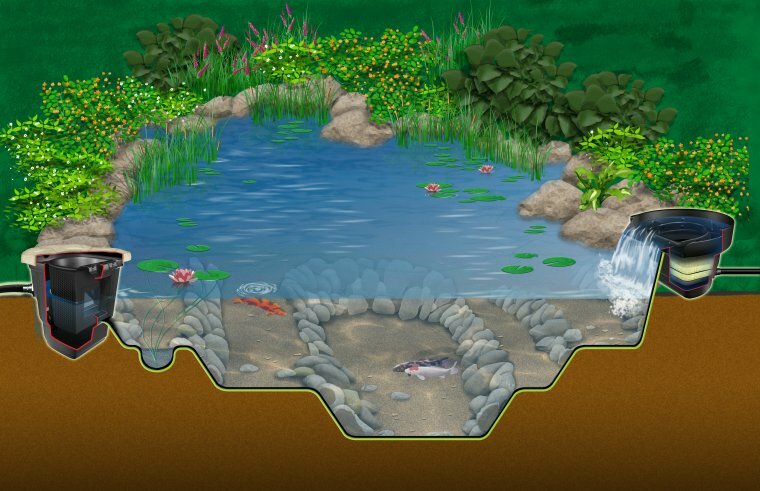 The Ecosystem Pond provides a natural, easy to install, low maintenance, beautiful investment for any home or property. An Ecosystem Pond consists of a biological filter and skimmer which combine to form a unique filtration system. Other necessary components are pond liner and underlayment, a re-circulating pump and plumbing, rocks and gravel, aquatic plants, fish and beneficial bacteria. All these elements are necessary to achieve a crystal clear, naturally balanced pond. Biological Filter A biological filter provides surface area for beneficial bacteria to colonize and remove excess nutrients. 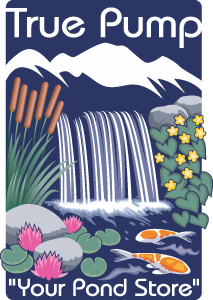 We recommend an up-flow biological filter which can be easily naturalized and will be the start of the waterfall and stream. A properly sized biological filter requires maintenance only once per year! Pond Skimmer A pond skimmer is a mechanical filter that removes surface debris from the pond before it falls to the bottom. We recommend an out-of-the-pond skimmer which pre-filters the pond water to prevent pump clogging and also serves as the pump vault and overflow system. All skimmer maintenance can be performed outside of the pond without ever getting your feet wet! Pond Liner and Underlayment It is important to use only high quality, durable liner that is properly installed to prevent leaks and conserve our most precious resource – water! Underlayment is a geo-textile fabric that helps to pad and protect the liner. We recommend 45 mil, fish safe, EPDM liner because of its strength and flexibility. Re-circulating Pump and Plumbing A pond pump is the “heart” of the ecosystem as it pulls water through the skimmer and pushes it up to the biological filter and adds necessary oxygen. The pumping system needs to run 24/7 for proper circulation and filtration. We recommend high-efficiency submersible pumps properly sized to achieve the necessary flow rate at the desired height. Rocks and gravel are required to add additional surface area where beneficial bacteria can colonize. Covering the liner gives the pond a very natural look and also protects the liner from UV rays. Aquatic Plants Aquatic plants are nature’s best filtration system, they will improve pond clarity by removing excess nutrients. Water lilies and other floating plants also reduce water temperature by shading the pond. Aquatic plants are a new adventure in gardening as they add color and texture and yet never need to be watered! Fish Koi and goldfish add color, character and interest to the Ecosystem Pond. These “wet pets” quickly become part of the family and offer great stress relief as they come to the surface to greet you and look to be fed. A common misconception is that fish require massive amounts of care and increase maintenance. In truth they are an important part of the ecosystem and require very little extra care in a properly constructed pond. Beneficial Bacteria Beneficial bacteria occurs naturally in the rocks, gravel and biological filter but needs to be supplemented weekly to maintain crystal clear water. A pond treatment product to control string algae may also be necessary to keep string algae to a minimum. 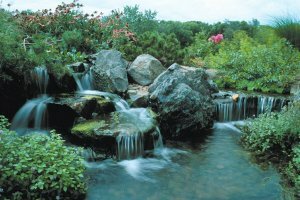 A properly designed and installed Ecosystem Pond will quickly become the gathering place in your yard and the spot you go to enjoy, reflect and relax. Your new backyard paradise is only a phone call or email to True Pump away!